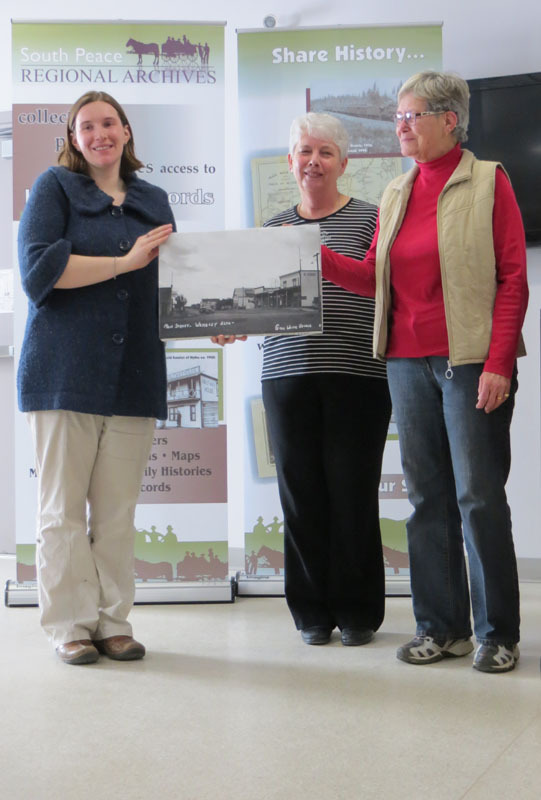 The South Peace Regional Archives has curated a new exhibit for the Community Room at the Grande Prairie Museum. The new exhibit features ten photographs from the SPRA collection that tell the story, “The South Peace Goes to War.” The ten photographs were chosen by SPRA staff from a variety of collections, including the Edward Heller fonds, Turner family fonds, and Harry Tuffill family fonds. Beginning with the first enlistments of 1914 making their way down the Smokey on the Beaver to the celebration of war’s end at Bear Lake, these ten photographs lead the viewer on a journey through the social history of the Great War. Below is a brief description of the exhibit. For more information, feel free to visit the exhibit in person. The Beaver Carrying Freight and Men To Enlist, 1914. The Beaver river boat is carrying freight and men who are going to enlist. Three men are sitting on the bow of the boat, another is poling and the rest are standing on the boat. French Troops in Camp, 1914 ca. World War I French troops in camp, with soldiers, officers, horses and wagons in the background. Five men in World War I uniforms standing on the main street (100 Avenue) of Grande Prairie. Businesses visible in the background include the Crown Café, a pool hall, and a confectionary. WWI Soldiers on a Break, c.1917. WWI soldiers at rest with their saddles, buildings in the background. Chas. T.M.Turner and his army friend during WWI. Soldiers Playing Cards, 1914 c.
Harry Tuffill playing cards with a group of World War I soldiers. WW1 Troops Sitting in a Trench, 1916. 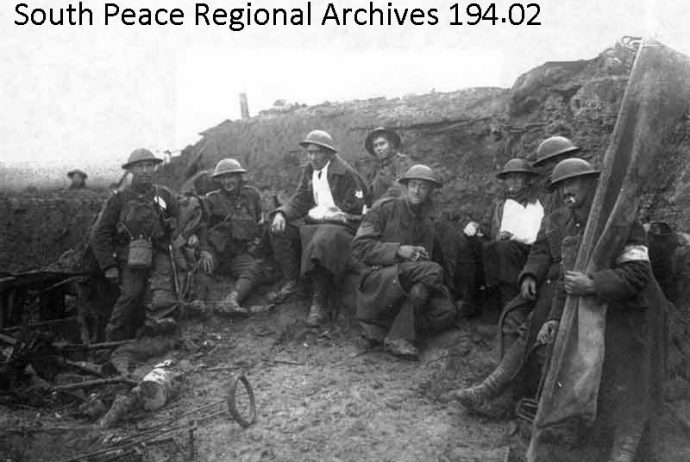 The photograph shows soldiers, some injured, sitting in mud behind a trench wall. One is holding a stretcher, two men each have one arm in a sling. WW1 Troops Trudging Across a Muddy Field, 1916. The photograph shows soldiers in the distance walking along a wired barricade through a very muddy field. Postcard showing a people gathering at Bear Lake for a picnic in honor of the Great War Veterans. The South Peace Regional Archives is pleased to welcome Alyssa Currie, who has taken over the role of Executive Director this week. Currie succeeds Mary Nutting who retired from her post. Currie was born and raised in Dawson Creek before attending the University of Northern British Columbia where she completed her Bachelors of Arts in English and History, then going to the University of Victoria, where she is currently completing her Masters of Arts. 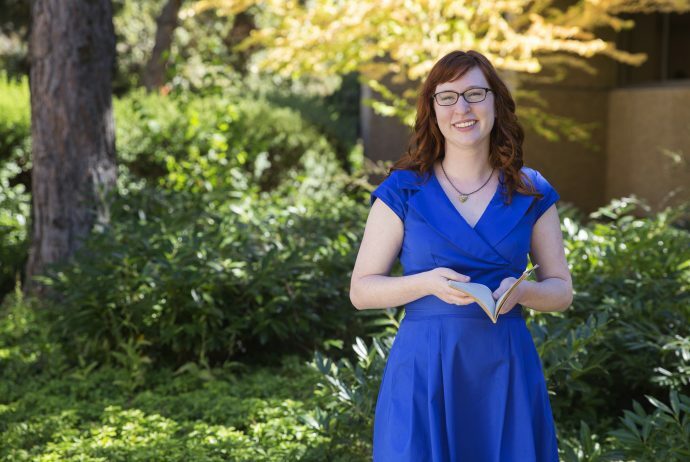 Her previous experience includes working as an Assistant Curator at the Pouce Coupe Museum, Student Archivist at Library and Archives Canada, and as a Recruitment Officer at the University of Victoria. 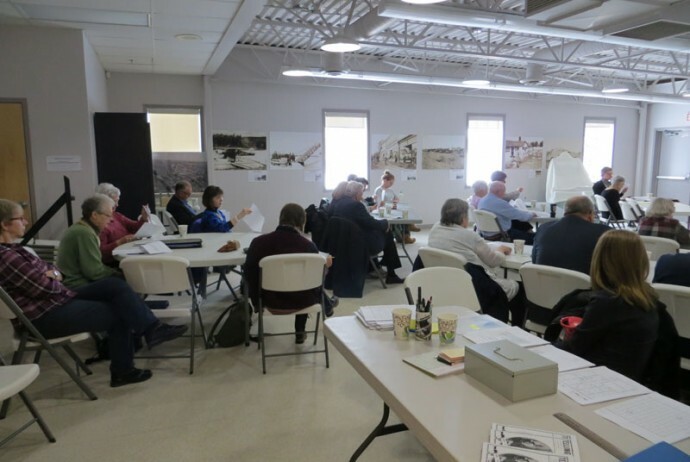 The South Peace Regional Archives continues its commitment to gathering, preserving, and sharing the historical records of the region. The archives enrich people’s lives by increasing their understanding and appreciation of the past. In spite of the wintry weather on Saturday, we had a good turnout for our annual general meeting. 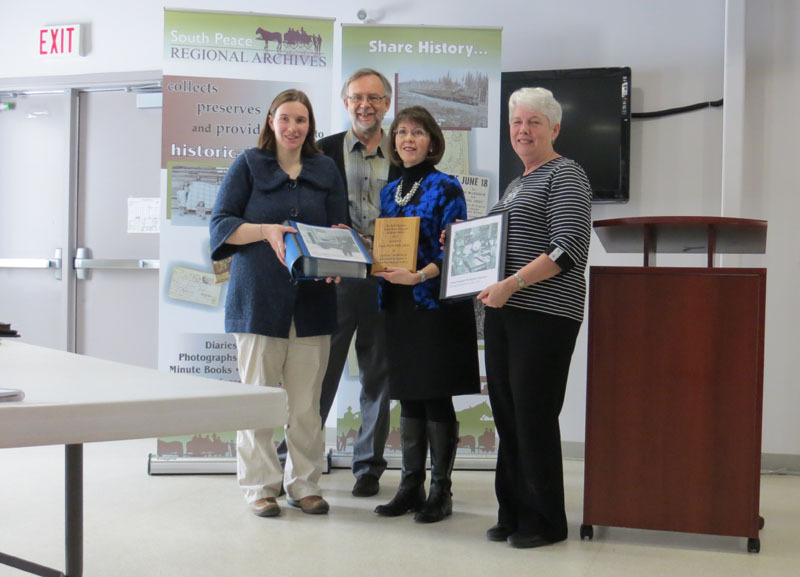 Maureen Curry, director of the Grande Prairie Public Library, received the Beth Sheehan Archives Award for the library’s valuable contributions to and partnership with the South Peace Regional Archives. Kathryn Auger received an award for contributing more than 1000 hours to the archives as a volunteer. 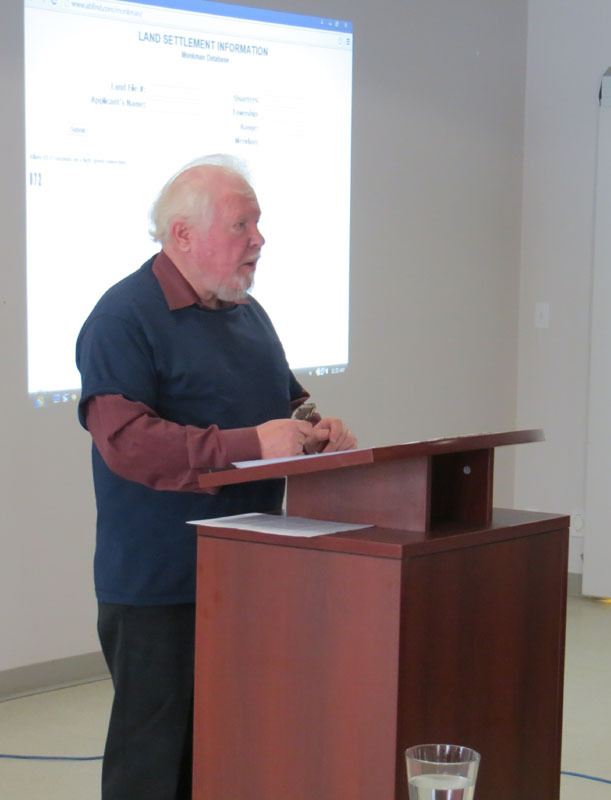 David Leonard shared with us his passion for the Peace Country Land Settlement Database project. Thank you to everyone who came out to join us and we’ll look forward to seeing you next year! A wonderful collection has arrived at the Archives. Clayton Greber came in and donated a large amount of information from his grandfather’s family. The collection is mainly from the Hodgson family who settled in the Hythe area in the 1920’s. 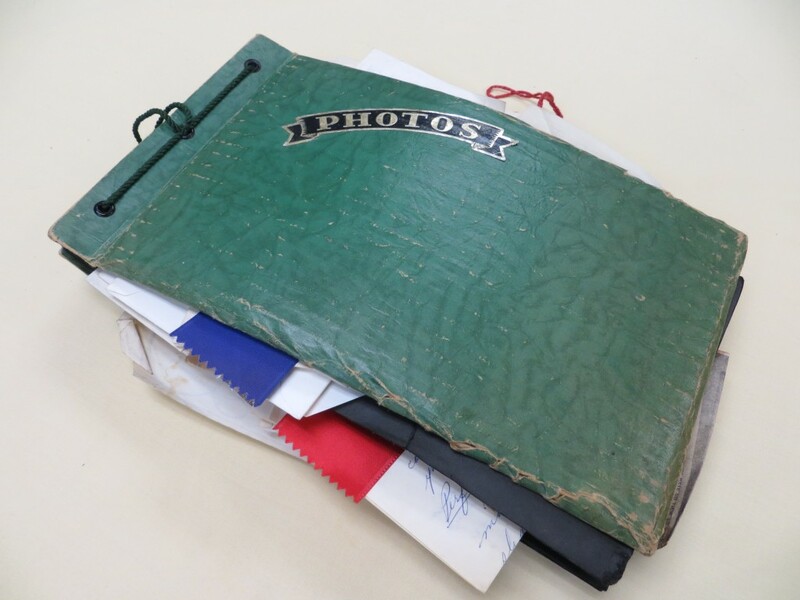 Included with the collection is a scrapbook that belonged to Clayton’s mother Edna Mae (Hodgson) Greber, and was created by her during her teenage years in the 1950s and 1960s. It’s wonderful how one item can be packed full of information, that depicts an era, a community and a person. There are wedding invitations, napkins from an anniversary, pianoforte exam results, graduation photos, fair entry ribbons, report cards, a speech, news clippings, letters, photos from plays, sports teams, and classmates. Edna was Carnival Queen, a Catholic Women’s League Scholarship winner, a basketball player and a pianist; all of that can be gleaned by the wonderful scrapbook she created. With this donation not only does her family know all these wonderful things about her – now you will too! 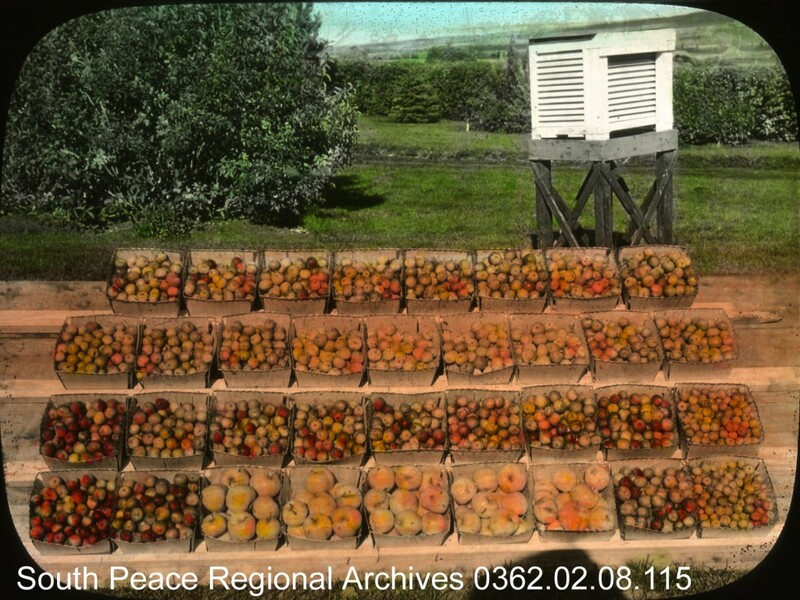 We take it for granted that we can buy fresh fruit year round, but it hasn’t always been that way. 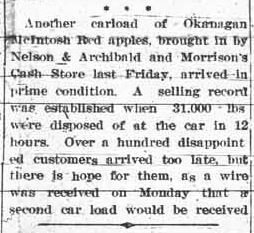 This article in “Local Happenings” and ads from the Sept. 27, 1932 Grande Prairie newspaper refers to two train car loads of apples coming in from the Okanagan! There are locally grown apples but not enough to meet demand. 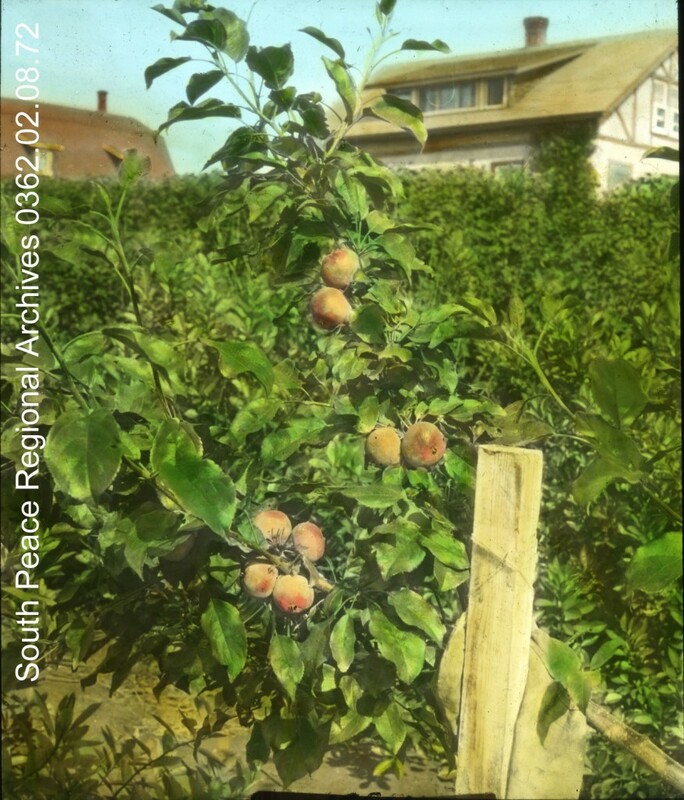 Here is an article found in the same paper about apples grown by W.D. Albright in Beaverlodge. W.D. Albright’s 1932 Apple crop from Beaverlodge Experimental Farm. 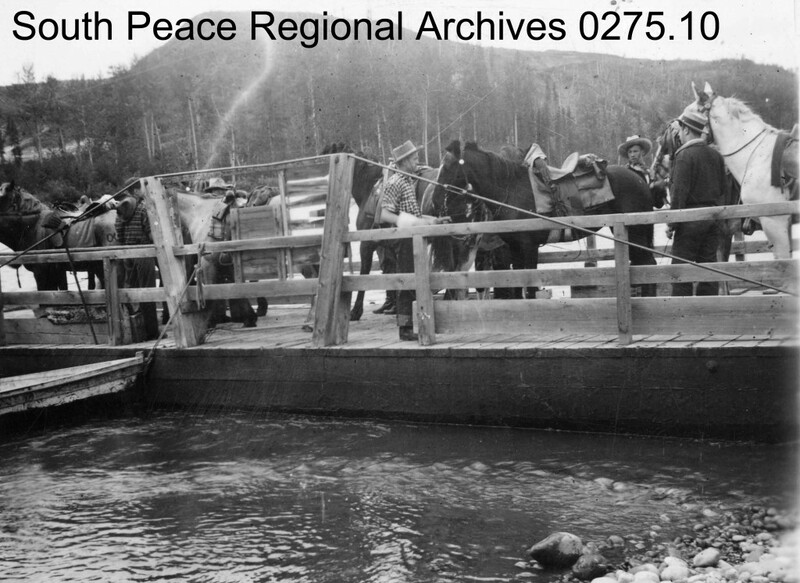 This week in history we are focusing on the Wapiti Ferry. This article sparked the interest of our “This Week in History” author who started to investigate and see what she could learn about the Ferry. Mike Lett provided her with a photo and she was able to uncover a bit more information. 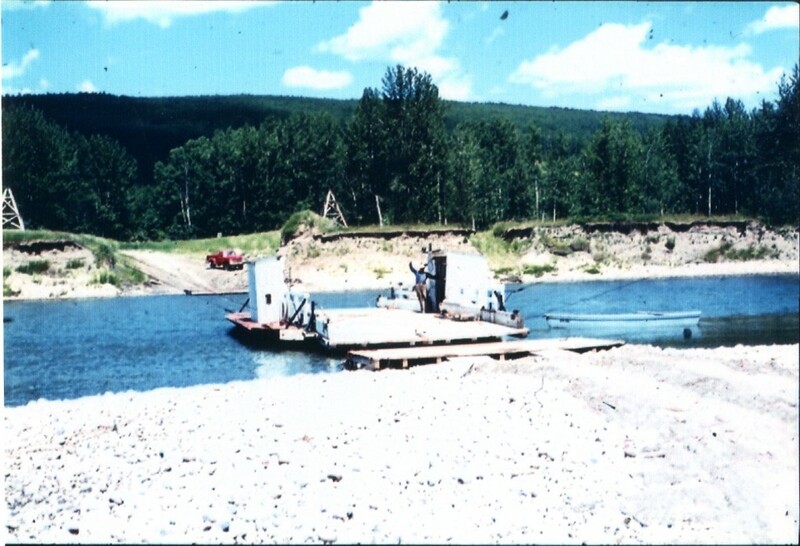 The Wembley Ferry was still operating but was used less after a bridge was built over the Wapiti, south of Grande Prairie (replacing another ferry) in 1958. A group of people had purchased shares in the ferry south of Wembley for $1.00 each, in order to keep it running. The Ferry was kept operational until a flood in 1970 washed out the approaches. Recently, restoration was considered by the County, but time had taken too great a toll. 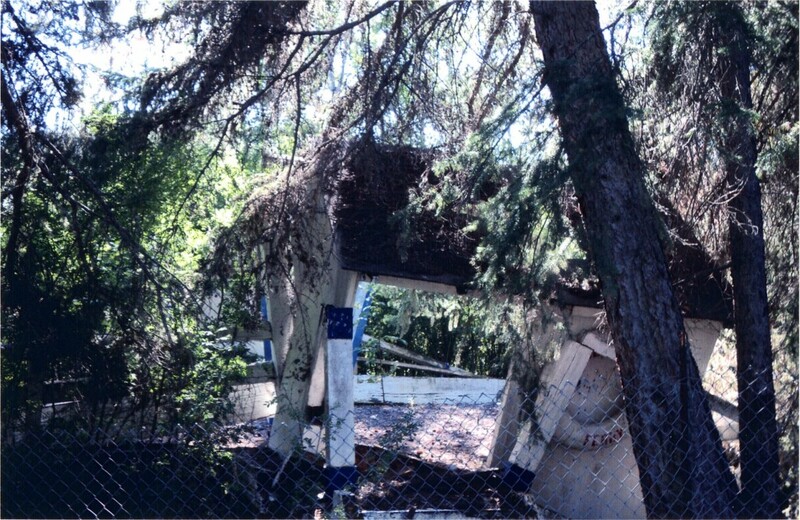 The old ferry is now being swallowed up by vegetation at Pipestone Creek Park. Photo taken by Mike Lett. Kathryn was able to find the remnants of the Ferry by the Pipestone campgrounds just last week.